Okay, perhaps it’s a bit early to be talking about sandals in January but here’s to hoping that you might be heading out on some fabulous vacation in warmer climates! Yes, I know, the price tag on the Pedro Garcia is rather bold to say the least but it is an extraordinarily comfortable wedge sandal. The nice thing about this review is that, if you know what you’re looking for in a good sandal – you should be able to find it in any price range. I have had patients bring in shoes that they have paid $800 for and they are crap. I have also had patients bring in $12 WalMart shoes that are fabulous. It’s simply a matter of knowing what you are looking for in a shoe as well as understanding what specific type of foot problem you have and what is the appropriate type of shoe for your specific foot type. The thick and rigid sole which will allow less motion across the foot which results in less mechanical strain and therefore – less pain. These sandals have strapping for the forefoot, midfoot and most importantly – the rearfoot. Secure strapping of these three areas means that you have more biomechanical control of the foot and ankle structures which will allow for less motion which equals less pain. If there is no rearfoot strap – you are forcing your tendons, muscles, joints as well as your knees, hips and lower back to work harder to stabilize your entire body. Instead of forcing your body to do the work – make the shoe do it! Remember, you are either beating up your feet or your shoes. If you think about what your shoes look like after a couple of years, that is what you are doing to your joints if you are walking around barefoot or in flimsy shoes. It’s simply a matter of “wear-and-tear”. It’s important that when you are shopping for dress shoes that your protect your feet with a thick rigid sole and proper strapping for biomechanical control. 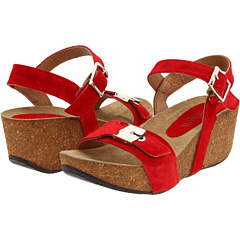 This type of wedge heel is great for giving you more “height” without stressing out the forefoot area. You’ll get the three inch heel height look but the foot is really only forced into a one to one-and- a-half inch heel height biomechically. If you have severe Hallux Limitus or Rigidus (limited range of motion across the 1st toe joint) or degenerative joint disease of any of the forefoot joints – these are not the shoes for you!